Budget Muffler Brake & Automotive is San Diego's best choice for affordably priced, expert wheel alignments. Our family-owned and -operated auto repair shop has served tens of thousands of satisfied clients in the San Diego area since 1941. We offer comprehensive wheel alignment services for two-wheel, four-wheel, and all-wheel drive vehicles of every make and model, both foreign and domestic. In fact, we're known for being one of the few auto repair shops in San Diego that caters to specialty vehicles, such as lowered Honda Civics and Accords, Acuras, 350Zs, BMWs, Lexuses, and Mustangs as well as Rolls Royces, classic cars, and high-performance sports cars. 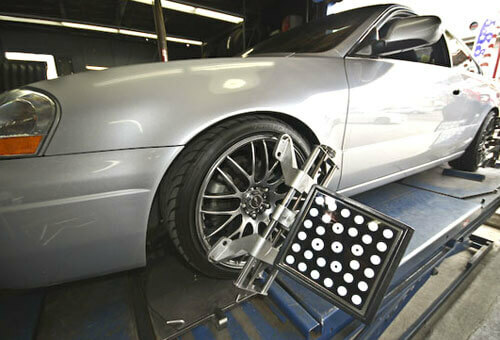 As a best practice, wheel alignments should be performed every six months as part of any car's routine maintenance. Having your wheels properly aligned will improve your driving control, increase car's fuel efficiency, and extend the life of your tires. Wheel alignments are also recommended anytime you get new tires, are involved in an accident, experience steering problems (such as the car pulling to one side of the road), or notice your tires wearing unevenly. Considering how important wheel alignments are to our customers' safety, our wheel alignment services are always performed by highly trained and experienced technicians and include a complete suspension inspection. If your vehicle requires replacement tires, we carry and install a diverse inventory of competitively priced tires from Michelin, Goodyear, BF Goodrich, and Bridgestone. Additionally, our technicians are able to perform custom camber corrections to suit our San Diego customers' desired applications, whether they want to reposition the wheels on their lowered cars or specify a specific number to get the drift they are looking for. Call Budget Muffler Brake & Automotive today to schedule a tire replacement or wheel alignment for your vehicle. San Diego customers receive a free recheck six months after their alignment service (with a free reset if necessary). Customers who buy a set of four tires receive an exceptional value as they receive a free wheel alignment; free tire rotation and balancing every 5,000 miles; free fixes for flats; as well as a free alignment reset six months after installation. Our wheel alignments are performed in a timely manner and you can relax in our comfortable lounge while you wait for your car.